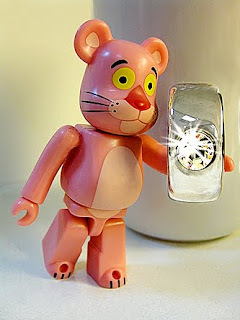 Do you know that in the the "Pink Panther" film series, the panther isn't really an animal but a large and valuable diamond? In the original 1963 version directed by award-winning American director Blake Edwards (Breakfast at Tiffany's, Days of Wine and Roses), a jewel thief known as "the Phantom", played by David Niven, plotted to steal the Pink Panther from its owner, Princess Dala (Claudia Cardinale). A French detective named Inspector Clouseau (Peter Sellers) played his klutzy adversary. According to the story, the pink panther diamond had a flaw that formed the shape of a leaping panther, and this image could only be seen if the stone was held up to the light in a certain way. It's interesting to note how an imperfection can make one all the more extraordinary. Remember supermodel Cindy Crawford's signature mole? Before her arrival in the modeling world in the 80s, such beauty marks were often airbrushed out of fashion magazine covers. But it became Cindy's million dollar trademark. 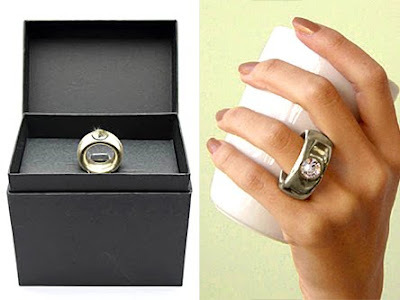 Speaking of gems, the Floyd Ring Cup (below) is as irresistible as a real diamond ring. It's so clever! I bought several cups at the Franc Franc store in Hong Kong and gave some to couple of friends who just celebrated their anniversary. The gem in the Floyd cup ring isn't a real diamond, but it's a genuine Swarovski crystal. I guess that's bling enough to impress, don't you? This gem-of-a-cup is still sold at mollaspace.com, at a price that's a steal. (Top, left) The Pink Panther Bearbrick is a collaboration between Medicom Toys and Universal Studios Japan.